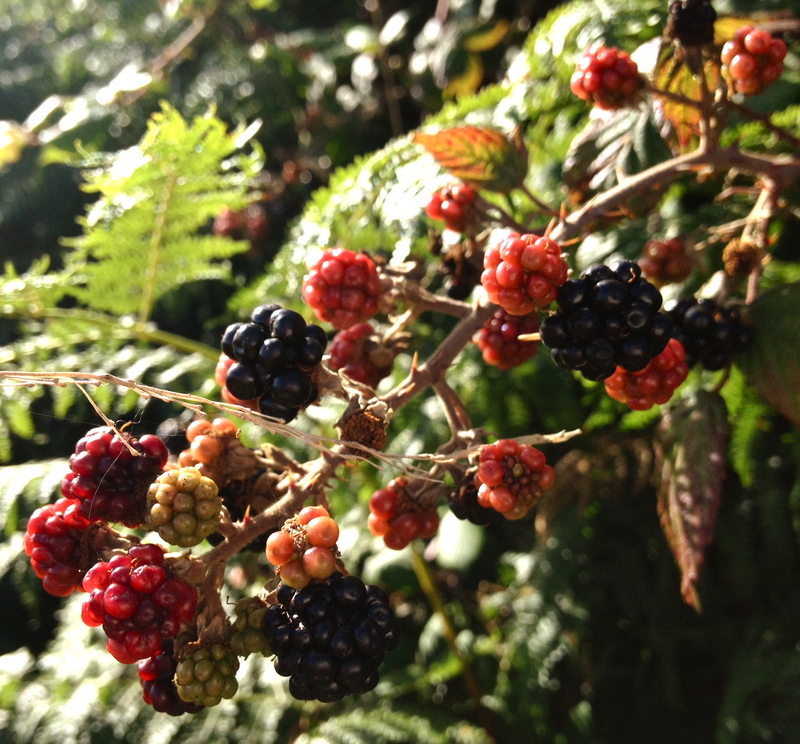 Blackberry picking leaves me a nostalgic and dewy-eyed sop. Perhaps it’s because I grew up on Brambly Hedge books, believing one could live in an oak tree and rural England really was full of enterprising field mice with umbrellas. Or perhaps it’s because my soft spot for Alan Bennett, who invented the verb ‘to blackberry’ (“I blackberry up the lane..” and so forth), transports me, when I blackberry, to some whimsical scene in which I’m a lonely-yet-contented woman picking blackberries and pondering the bittersweet moments of my life. The dog, in contrast, is incandescent that his walk is being constantly and unpredictably interrupted at every turn. Even a lick of blackberry and white chocolate ice-cream doesn’t appease him. 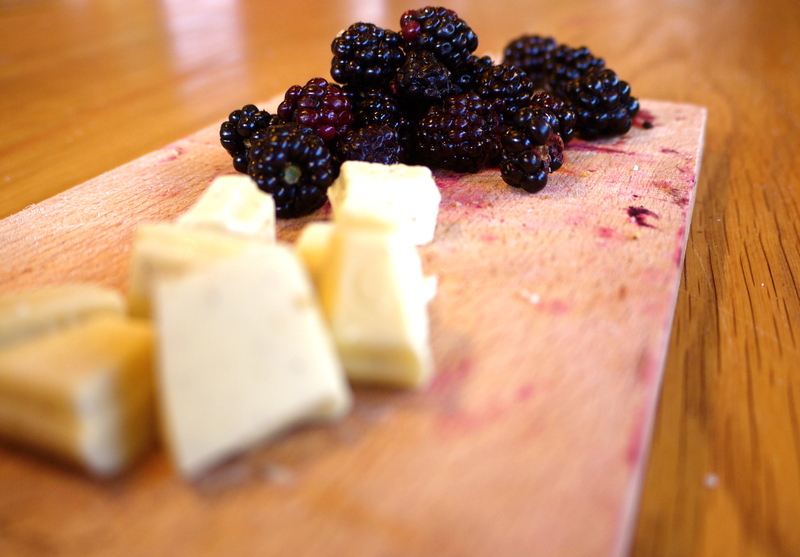 White chocolate is to blackberries what David Attenborough is to natural history: it makes the mildly interesting, sensational. Scald the milk and cream in a pan. Meanwhile, beat the egg yolks and sugar together until pale. Pour the milk over the egg mix whisking constantly to avoid lumps. Wipe the milk pan out (under cold water to cool it down and remove any milk solids) then return the custard to the pan on a low heat. Stir constantly until it thickens (75 degrees, or thereabouts) and never let it boil. While still hot, break the chocolate into small pieces and add to the custard, stirring until it melts. Leave to cool before churning in your ice-cream maker. Whilst it’s churning, heat the blackberries over a medium heat until they start to break down. Add a teaspoon of icing sugar and mash up the fruit, tasting until the sweetness suits (remember the chocolate will be super sweet so keep some blackberry tartness to balance that). Push through a sieve to remove the seeds and cool. 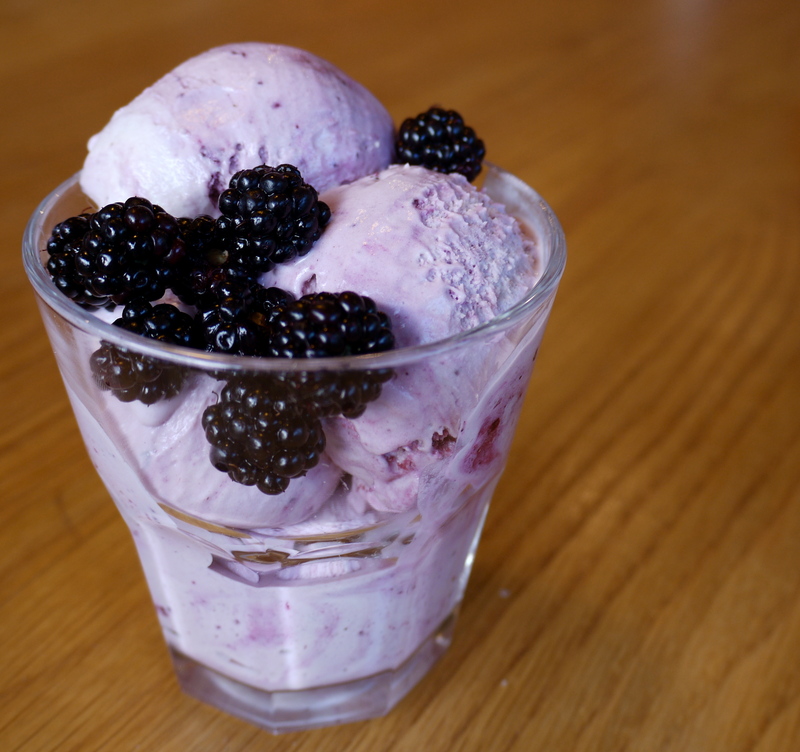 Just before you pop the churned ice cream in the freezer, drizzle over the cooled blackberry sauce and swirl through the tub to create a pleasing mottled effect. The addition of the almonds and the coconut palm sugar really gives this classic crumble a sophisticated edge (ok, maybe not sophistication, but certainly a spruce up). To make the topping, rub together the flour, porridge, almonds and butter in a bowl until crumbled. Don’t overdo it – too fine and it sets hard, a rough chunk is ideal. Lay the apples in the bottom of an ovenproof dish and scatter the blackberries on top. No need to sweeten the filling, the topping is very sweet so will compensate. Pile the topping on and bake at 190 degrees for 35 minutes. Yum! (and I could certainly polish the ice cream off on my own!). 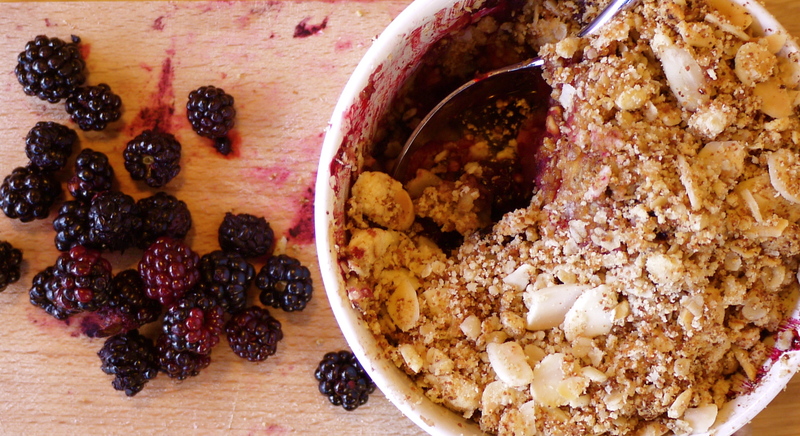 The addition of almonds to the blackberries (I have only previously used them in conjunction with strawberries in crumbles) is definitely one to try. Very entertaining, lovely post! Makes me want to get out blackberrying so I can do some bittersweet pondering as well as try your lovely recipes. Bless you, that’s very kind. Enjoy your pondering! Oh you’ve just inspired me to go out collecting and it’s probably far too late. Off to Abergavenny for the food festival tomorrow and may just have to find a hedgerow on the way. I’ve never tried white chocolate with blackberries and I’m intrigued, especially after the David A comment. My partner has produced quite a few programmes with him at the Beeb so I’ll keep quite about the “mildly interesting” facts that he has to present!